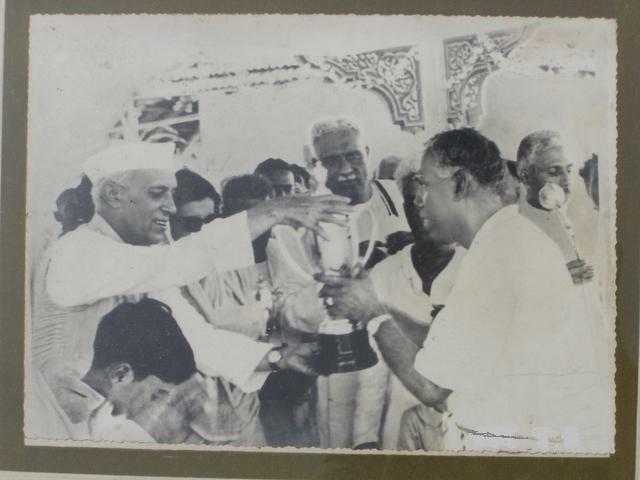 Jawaharlal Nehru presenting a trophy on the occasion of the First Boat Race in Alleppey, 1952, which is the predecessor the now famous Nehru Trophy Boat Race in Alleppey, Kerala. In the middle ( the tall person) is Late T M Varghese, the then Home Minister of Travancore Cochin. Photograph contributed by Jerry Verghese .